You may play with these settings. Those given here should not perform any lossy conversions or strip away important document structures. Meaning: most of the time the savings gained might be very good, but sometimes the file size even increases. Ghostscript is available through a number of venues for macOS. The related muPDF is even available on the App Store. If you created the PDF yourself then it would be obviously best to losslessly reduce the images before including them into the document (the PDF). Adjusting the image size in terms of pixel count/resolution appropriate for the intended output medium might produce the biggest savings. Not the answer you're looking for? Browse other questions tagged macos lion pdf preview . 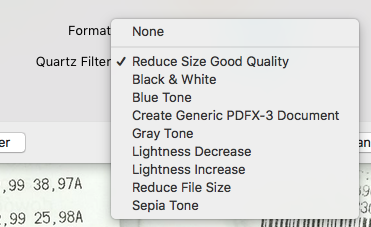 How to get my Mac (High Sierra) to recognize custom Quartz filters I created to reduce file size? Preview: reorder pages in pdf increased file size?